Multi-purpose gear for hikers, backpackers, and other outdoorsmen gets better every year. If you make the Buck 731 X-Tract LED Multi-Tool part of your kit, there's at least one extra thing you can leave home, and possibly more. This 6.4-ounce toolkit lightens your load. This compact multi-tool offers several useful tools in addition to a hollow ground, combo-edged drop point blade of high carbon 420 stainless steel. The one-hand opening lockback knife is still the primary blade of the tool and with three inches of cutting edge, it's enough to get you by. Hunters and fishermen will want more, but for the average backpacker it's a reasonable choice. Since everyone today carries something high-tech, it's always helpful to have some mechanical tools along -- in case a fitting on the pack or tent or boots breaks and you have to be creative. The X-Tract includes a small pair of pliers, a Phillips and flat-head screwdriver, and wire cutters -- all of which could come in very handy when unexpected things go wrong. There's also a bottle and can opener if you've forgotten the most important part of your mess kit. 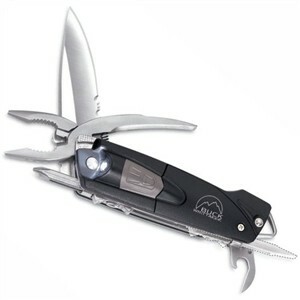 All tools in the Buck 731 open with one hand and lock in place for use. Under the rubber-coated thermoplastic handle cover lies another useful feature, an LED light powered by two flat coin-sized batteries. It's not the lamp you'd depend on for the long walk home, but it's a great backup to have around. Power-saving circuitry turns off the LED after three minutes. Access to the battery compartment requires a small Phillips screwdriver, so if you need to install new batteries, do it before you hit the trail. The 4-1/4-inch Buck 731 doesn't include a pocket clip, but a tough nylon belt pouch is part of the deal. The base of the knife provides a stainless steel lanyard loop big enough to string a wrist lanyard or clip on a carabiner. For the same multi-tool without the LED option, see this Buck X-Tract Multi-Tool.